and working within the Spanish constitution. 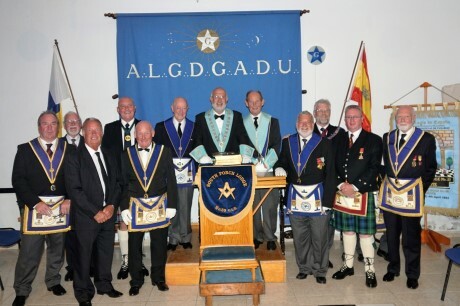 Installation night 2016, for W.Brother Stephen Elwell, installed into the chair of King Solomon, at a meeting attended by many visitors from the local area and visiting Bretheren from the UK and Ireland. 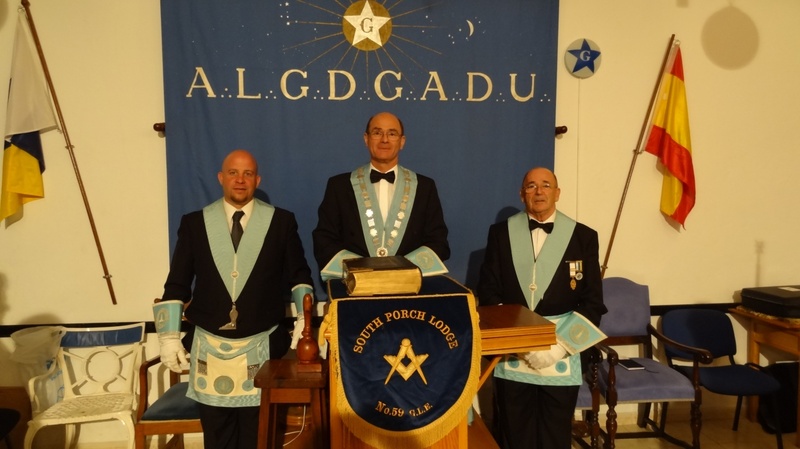 Installation night 2015, for W.Brother Anthony (Tony) Berks who was installed in the chair of King Solomon, again it was a great Installation Ceremony as echoed by the visiting Brethren. Installation night 2014, for Brother Robert (Bob) Williams who was installed in the chair of King Solomon, it was one of the finest displays of an Installation Ceremony we can honestly say the Lodge has witnessed, which was echoed by many of the visiting Brethren, the Installing Master W/Bro. Alan Harper was practically word perfect, delivering the Inner workings, which was the full (extended version). Another night to remember with another candidate for initiation, Mr. John Spinks; truly first class floor work by the Master, ably assisted by his Office Bearers. Their work again was excellent and this was echoed by the applause from the visitors, this means two more initiates for this ensuing year for South Porch Lodge. It was clearly a night to remember for the Senior Warden, Bro. Alan Harper Master Elect who was installed in to the Chair of King Solomon by W/Bro. David Poxon, Installing Master. A truly excellent display of Masonic Ritual, several visitors including one Grand Officer from U.G.L.E, commented that "the floor work by the Officers in general was outstanding". The Temple was full to capacity with fifty three at the Festive board. It is many years since that number was achieved, a sigh of relief from the Catering Manger because the Temple can not take many more for dining, but Wendy Knowles our Chef coped as usual. Those who were unable to attend missed one of the best meetings for a long time. A big thank you for W/Bro. Gilbert Howard, our Honorary Organist, for tickling those ivories, we haven't seen him for some time. 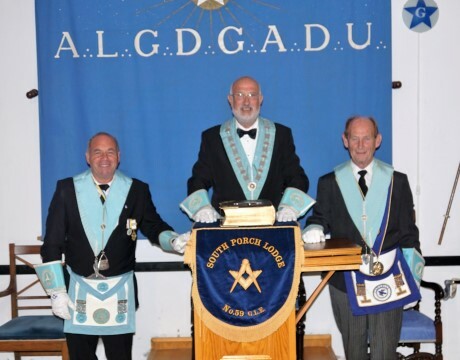 The Lodge have high hopes that Alan will continue to bring the harmony, which was once enjoyed by some of the veterans of South Porch Lodge, it is hoped the pressure will not be too much to bear. The evening was proven to be an excellent night to remember. W/Bro. Norman Lund was Elected Preceptor for another term with a unanimous vote. 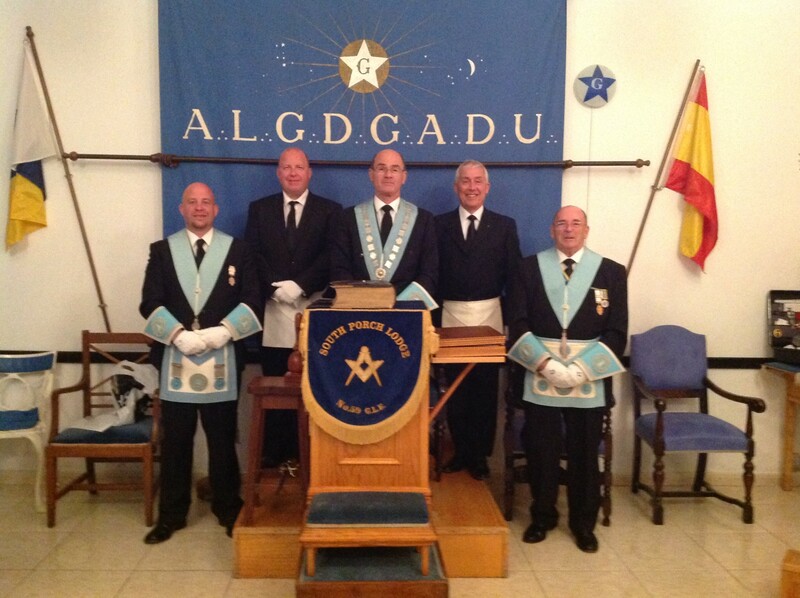 The Lodge of Instruction commenced under the supervision of the Preceptor, the Volunteer Candidate was W/Bro. 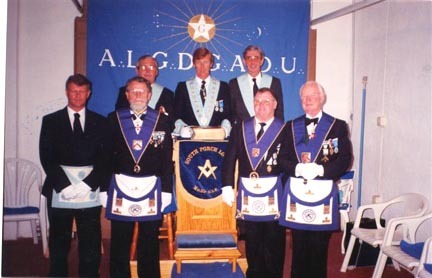 A. Francis with the Master and his Officers demonstrating a very commendable display of Emulation ritual which will probably the future quality to come. The attendance only captured 12 including one visitor those who missed out missed an excellent evening followed by a very cosy and happy festive board. Due to the sad loss of our Senior Warden (Master Elect), Brother Josh Morris; W. Master David Poxon was required to occupy the Chair of King Solomon for a further year. 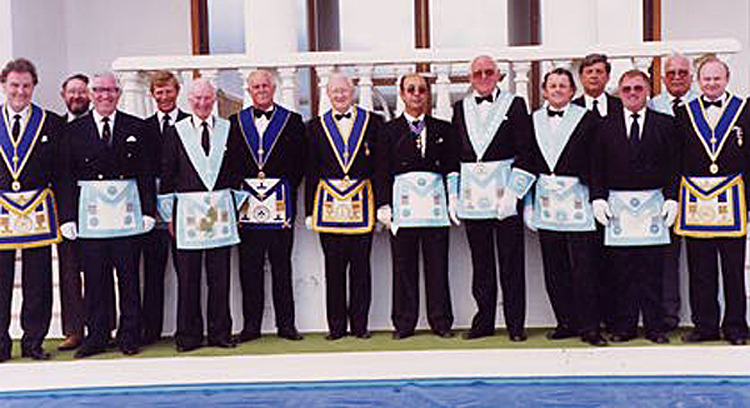 Based on the performance of the Lodge during 2011, then all members were pleased that the W. Master was very happy to continue in the Chair. 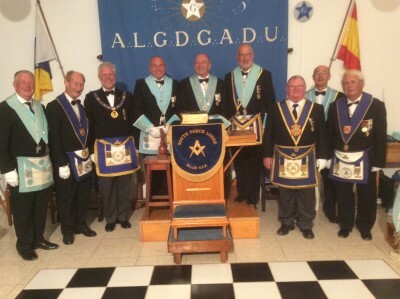 The new W. Master David Poxon with his Wardens, and photographs of Many other attending this excellent Installation. Many Visiting Brothers from Atlantidad and other UK lodges were in attendance for the ceremony and an excellent Festive Board, including "Uncle Colin". South Porch Lodge are lucky to have some very generous Members. Brotherly love, Relief & Strewth! The 122nd Regular Meeting of the South Porch Lodge No: 59 was held at the Masonic Centre, Avenida del Inverandero 12, Argana Alta, Arrecife de Lanzarote, on Tuesday 10th February 2009 at 18-00.hours. 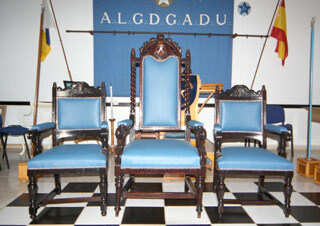 Then followed a presentation of three Chairs a Master and two Wardens each of which had been given to South Porch Lodge No.59 in Lanzarote after being retrieved from the cellars of The Queens College, Taunton Lodge No.6988 in the Province of Somerset, United Kingdom. 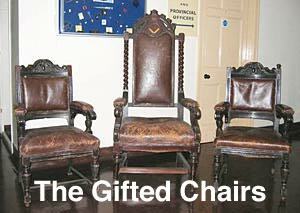 The Worshipful Master of the Queens College Lodge then proceeded to related to the history surrounding them, as far he had been able to research that two Wardens Chairs had very probably started life in the Cafe Royal London in the early part of the 20th Century. That pair were not matching exactly, but close enough to the “trained eye”. The Master’s Chair was believed to have been from a different source, namely the “Holborn Lodge” and dated around the turn of the Century. W/Bro. Robert Hewson took on the restoration project, (Each Chair was in somewhat dilapidated condition) and as an upholsterer of some standing was able to say that the construction method and materials used dated the Master’s Chair to the “turn of the Century” and the other two a little later. With the assistance of W/Bro. Arthur Francis who dealt with the stripping and polishing many hours of work produced three excellent pieces of Lodge furniture. W/Bro. David Sargison Secretary of the Lodge then presented South Porch Lodge with a beautiful painting of the Queens College in Taunton, Somerset through which the whole exclusive membership of their Lodge had passed including many notable Masonic persons. The Worshipful Master of South Porch Lodge Norman Lund reciprocated on behalf of the Lodge presenting Queens College, in the person of W/Bro. Andy Rodgers (Master) with a solid Glass Tablet inscribed with the Masonic Emblem expressing our gratitude for their most generous gift. From a very humble beginning, in the disused storeroom of a village shop. 14 years ago, a minimum quorum, a few chairs and a piece of linoleum containing black and white squares, they have grown to a complement of 30ish members, and a queue of prospective candidates. However, a worshipful Brother founder member who was a very competent Carpenter/Cabinet maker had produced three excellent pieces of furniture for the Master and each of his Wardens, but not special chairs. 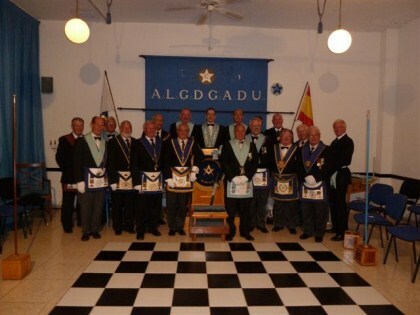 This has of course remained with the Lodge, and is in place in the permanent building in Arrecife, Lanzarote. The secretary of the Lodge, W/Bro. Peter Slade, has for some time expressed a desire to try and obtain chairs that would be suited to the Principles and finally circulated a great number of UK Lodges by letter, phone and Email, asking if anyone could help, with unwanted or redundant chairs. He received many replies but without positive results. Later however, came a case from The Queens College, Taunton Lodge, No 6988 in the same Province as Peters mothers Lodge (St Keyna) with an offer of 3 very old and redundant chairs, whereupon an agreement was made to collect them by Peter who was visiting the UK in June. With the help of W/Bro. Patrick Cousins from St Keyna Lodge the chairs were collected from the cellars beneath the building, and brought back to Peters home (in UK), then the following day, taken to Heathrow, then to Lanzarote, collected and taken to W/Bro. Robert Hewson (upholsterer) who is in the process of restoring them to their former glory. 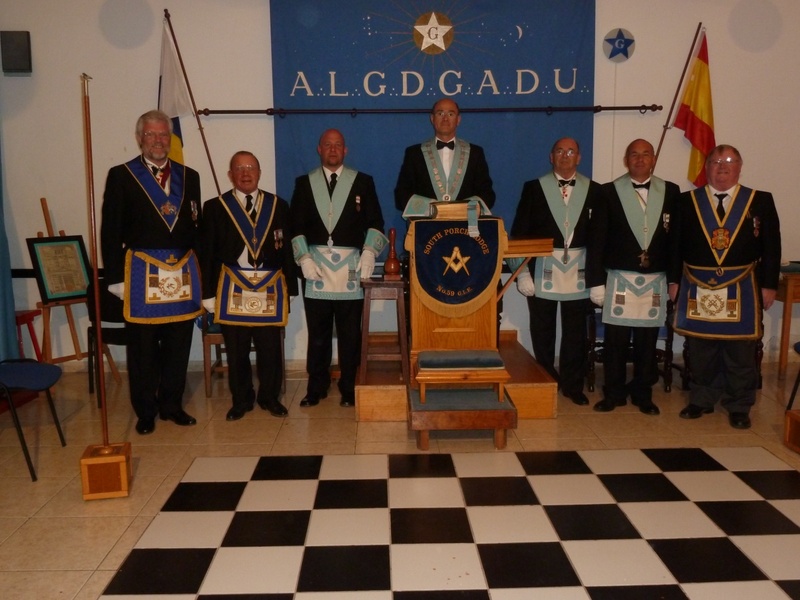 Whilst at the Queens College Lodge an invitation extended to the brethren to visit Lanzarote, and a number of them took it up. 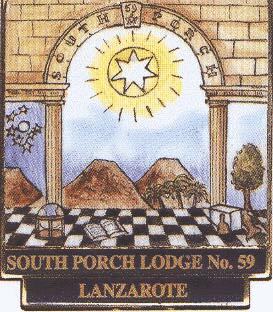 This however, was prior to the air travel problems that have arisen, which may mean some re-arrangement, but nevertheless a solid link has been formed between, The Queens College Lodge and South Porch Lodge No 59 in Lanzarote with the certain knowledge that many new friends will be made in the true Masonic tradition. 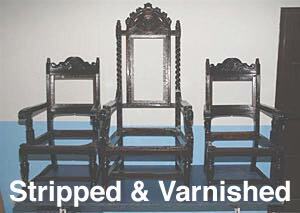 The Chairs have been completely stripped, assembled making good the joints, and ready for varnishing by W/Bro. Arthur Francis. They will then be taken back to Robert for the final touch to be upholstered. 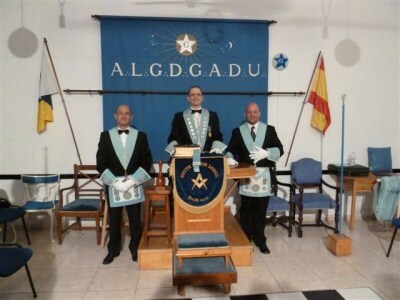 It was some time in the year 1983 when my Mother Lodge in the UK gave me permission to make enquires to The Grand Lodge of England requesting to know if there was any Masonic activity in Lanzarote because we had decided to make more use of the Bungalow that we had bought here. The answer I got was from a retired English Major, whose name escapes me at the moment, who was the current Grand Secretary of Spain. There was only one Lodge in the Canary Islands and that was Tiede Lodge No.34 which is situated in the North of Tenerife. At that point I had forgotten all about my Masonry career. 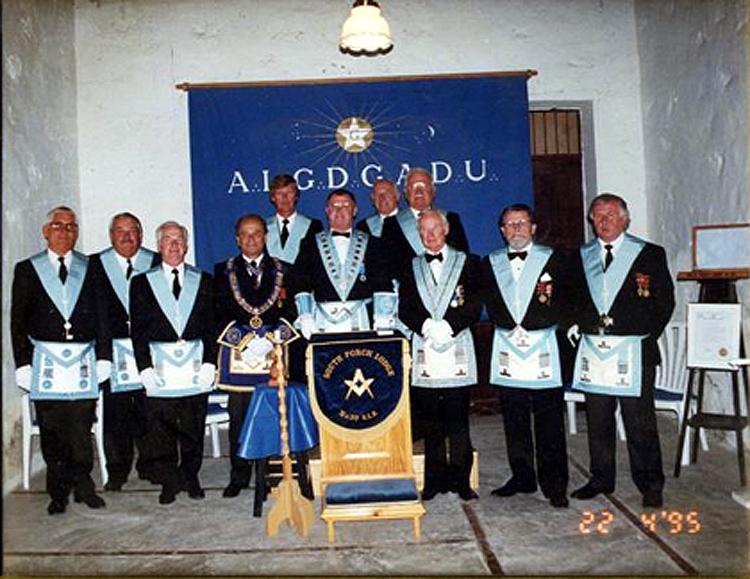 The Birth of a Lodge on Lanzarote, at this point unknown by me, was already on the way. Some time later on June 19th 1990, on the Quay at Arrecife Harbour, I was queuing for the ferry to Cadiz when suddenly I heard a voice behind me saying "Ha! English! now I will have some one to talk to on the voyage". It was a Brother but at that point I wasn't aware of this. We talked on the ferry on a few occasions and he came across to me as a very interesting chap. dis-embark, my new acquaintance came up to me to say farewell. He asked if I would be interested in forming a Lodge on Lanzarote. I was Speechless. How did he know I was a Mason? It was a subject we hadn't talked about on the journey. Perhaps he will let me know one day, I thought at the time, but since this was written he's passed to the Great Architect above. Some weeks later, when I returned to my home in Lanzarote, our paths crossed again and I learnt that my new friend was a P.A.G Registrar. He enquired at that point if I was still interested in forming a Lodge. I would like to know more was my reply. Later he introduced me to another Mason who was retired from England and also P.Prov.A.D.C (West Lancs) as well as being a W/Bro. 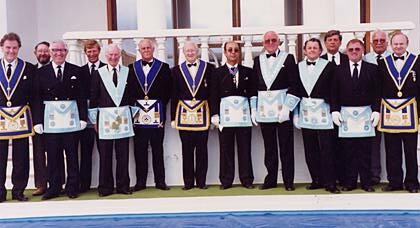 from Atlantic Phoenix Lodge in Bermuda. There's universal for you ! Later four others joined us and slowly things started to fall into place. W.Bro.Maybury invited me to his home where he was already making the furniture for the Lodge. It was, and still is, beautiful and all hand made. It must have taken months. His retirement from Spanish Masonry after vacating the Chair was a sad loss. However, books and regalia were brought out from England and a Petition was duly signed. We were summoned to Las Palmas, Gran Canaria, for the Consecration on the 4th April 1992. All seven founder Members were present, one had to withdraw due to personal reasons, some of us hardly knew each other! 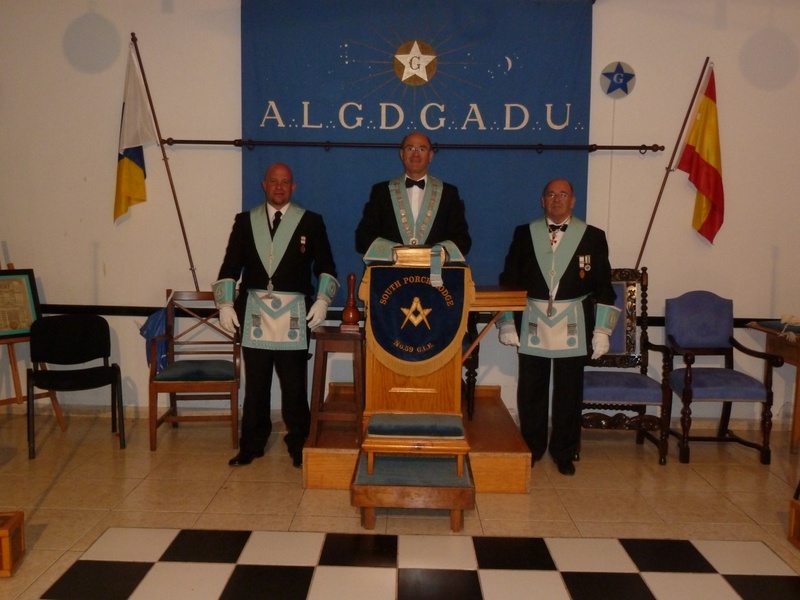 The Provincial Grand Temple was then situated on the fourth floor, in a little back street of Las Palmas town, but the Ceremony was most impressive, with the M.W.Grand Master M.R.H.Luis Salat Gusils, himself seated next to the Provincial Grand Master R.H W/Bro. Fernando Robania, who was the Consecrating Officer. The original four of us became the first Master, Wardens and Senior Deacon and all passed through the Chair in that order. Each in turn became a Provincial officer, one acting Provincial Grand Sword Bearer and the others a pass rank. 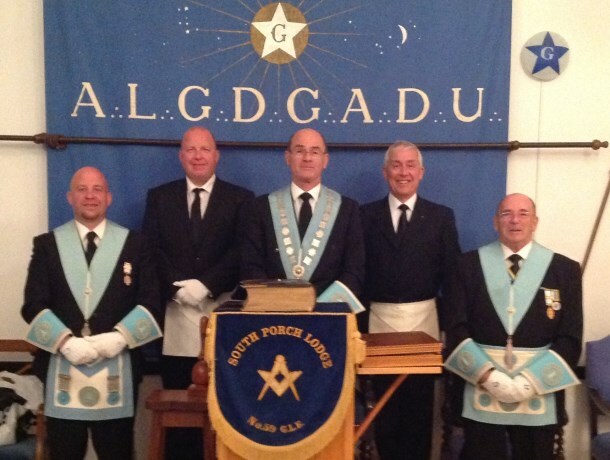 Since then South Porch Lodge has gone from strength to strength, with many Provincial promotions. When this story was written we had twenty three Members. However, at today's date we have thirty one, with four Honorary Members, and Candidates for Initiation as well as new joining Members in prospect. At this time the Chaplain, Treasurer, Secretary and Director of Ceremonies were all past Masters of the Lodge with the Wardens both Initiates of the Lodge. At the time of print one is going around again. Of course, we have had our ups and downs like any other group of men from different walks of life. You need to find your way and the more experienced Masons explain that its common with the forming of a new Lodge. Having said that South Porch Lodge is firmly on its way up due to the team work of the members as a whole. We must not forget Brotherly Love, Relief and Truth play a big part in Masonry and that is the base on which to build our future. We are very fortunate to be blessed with a very good attendance of visitors, some offering sound guidance. We cannot remember a Lodge meeting without two or three visitors, in fact, in the early days they out numbered us. Subsequently they were given acting jobs. What of the future? 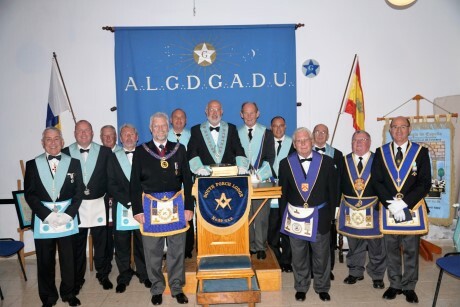 Our main objective was to form a Royal Arch Chapter and this has now been achieved with the help of both the English and Spanish Lodges to swell the numbers. We are now enjoying a queue for new Exaltes and Joining Members. Who knows, maybe some other side degrees. Finally I would like to thank the Provincial Grand Lodge of the Canary Islands from whom we have received so much support and encouragement over the past momentous years. 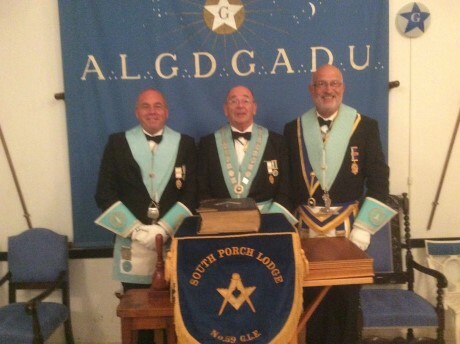 My thanks also go to two Members of South Porch Lodge for giving me the assistance I needed to compile this article. 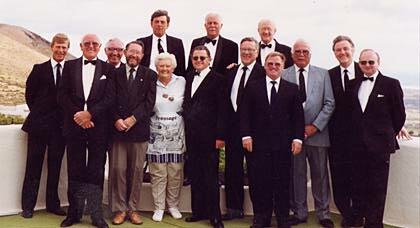 The Photo's below show our Founder Members in Full Dress and with Visitors. This Story was written many years ago and will soon be updated because there are many things, which were unknown to the writer at the time, that have since come to light. The Province of the Canarias. The Grand Lodge of Spain. Website Owner: V.W.Bro Peter Slade P.A.Pr G.M. P.G.D.C.